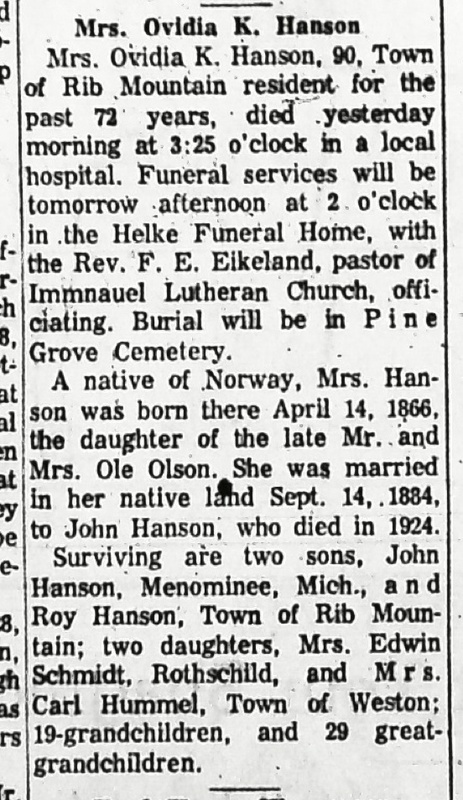 Recently I discovered that Norway has allowed online access to a wide variety of genealogical documents (parish record, census records, tax records, probate documents, etc) that would allow me to dig much more deeply into the past of my Norwegian family. I’m presenting a reasonably terse version of my findings here for Ovidia Kristine Olesdatter, who was my great-great-grandmother. I’ve already posted the story of her life as it was documented by her daughter Olga Hanson Schmidt. This will give her entire five-generation tree back to her 2x great-grandparents (my 6x great-grandparents) and in some cases her 3x great-grandparents (my 7x great-grandparents). Ovidia Kristine Olesdatter was born 14 Apr 1866 on Ryum Farm in Nærøy, Nord-Trøndelag, Norway. Her parents were Ole Zachariasen (1828-1913) and Christine Dorothea Christainsdatter (1829-1914). 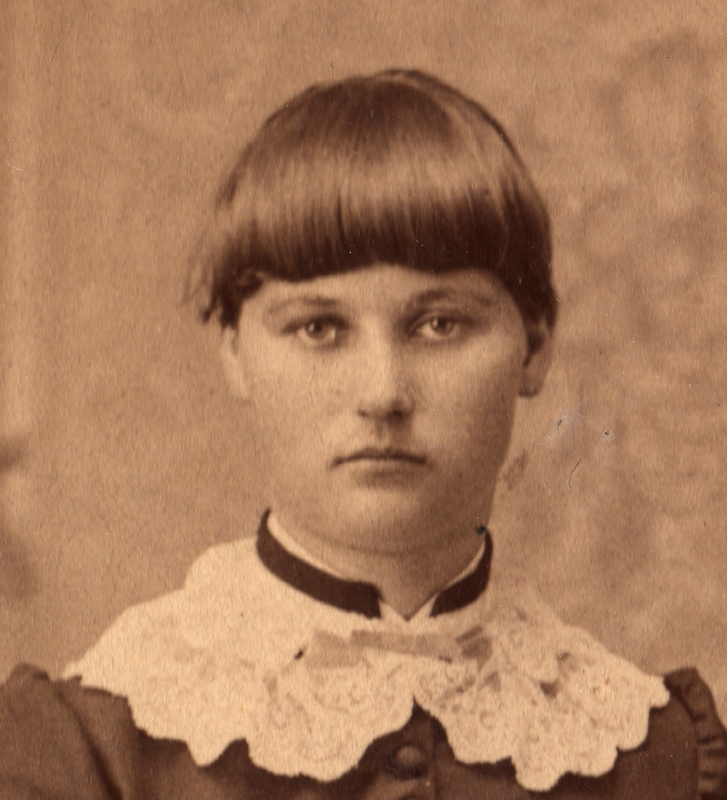 Ovidia was baptized in Nærøy on 29 Jul 1866 and confirmed in Vikna on 18 Sept 1881. She married Jens Rasmussen in Vikna, Nærøy, Nord-Trøndelag, Norway on 12 Sept 1884 where both bride and groom were listed as being from Ryum Farm. 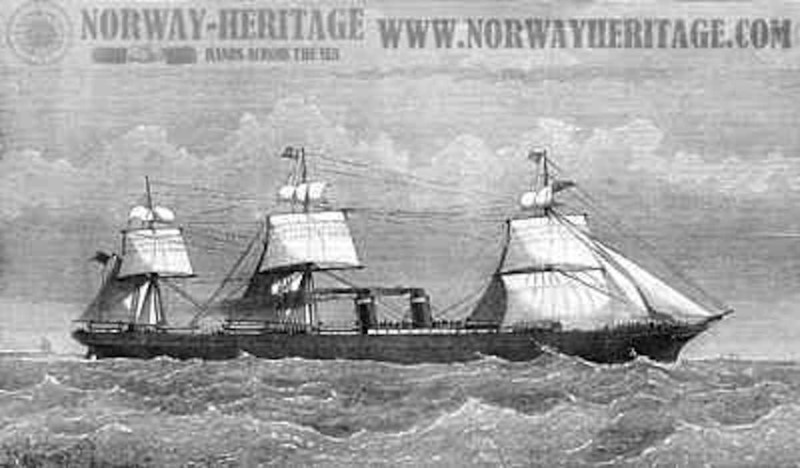 The newlywed couple departed Bergan, Norway for New York, USA on 8 Oct 1884. They settled on a homestead on the side of Rib Mountain near the town of Fleith, Wisconsin around 1889, and they both farmed there until the end of their lives. Children of Ovidia Olesdatter and Jens Rasmussen (all born in Wisconsin): Roger Hanson (1887-1888), Olga Johanna Hanson (1891-1990), John Albert Hanson (1894-1980), Mabel Esther Hanson (1897-1992), Roy Sigvard Hanson (1900-1972). Ovidia died in Wausau, Marathon, Wisconsin on 19 Aug 1956 at the age of 90, and was buried in Pine Grove Cemetery in Wausau. Ole Zachariasen was born 10 Jan 1828 on Muusem Farm in Verdal, Nord-Trøndelag, Norway. His parents were Zacharias Pedersen Melbÿe (1793-1869) and Martha Olesdatter Muusem (1797-1888). Ole was baptized on 17 Feb 1828 in Verdal. He married Christine Dorothea Christiansdatter in Nærøy, Nord-Trøndelag, Norway on 12 Oct 1851. The groom was listed as being from Aagnig Farm, the bride from Evenstad Farm. Ole and Christine had the following children: Caroline Margrethe Olesdatter (1851-1935), Søren Christian Olsen (1854-1854), Søren Christian Oluff Olsen Ryum (1856-1926), Albert Marthin Olsen Ryum (1861-1943), Casper Odin Olsen (1864-1864), and Ovidia Christine Olesdatter (1866-1956). Ole is listed as a pensioner in the 1900 census for Vikna, Nord-Trøndelag, Norway on Aagvikmyren Farm. He died in 1913 in Vikna at the age of 85. Christine Dorothea Christiansdatter was born on Slatterøen Farm on 1 Jun 1829 in Vikna, Nord-Trøndelag, Norway. Her parents were Christian Anderssen Lund (1794-1840) and Christenze Dorothea Hansdatter Tÿggestad (1792-1881). Christine was baptized in Vikna on 5 Jul 1829. She married Ole Zachariasen in Nærøy, Nord-Trøndelag, Norway on 12 Oct 1851. The groom was listed as being from Aagnig Farm, the bride from Evenstad Farm. Christine is in the 1900 census for Vikna living as a pensioner on Aagvikmyren Farm. She died in 1914 in Vikna at the age of 85. Zacharias Pedersen was born 27 May 1793 on Melbÿe Farm in Verdal, Nord-Trøndelag, Norway. His parents were Peder Halvorsen Lille Borgen (1751-1831) and Maridt Zachariasdatter Guddingsvald (1753-1825). Zacharias was baptized 2 Jun 1793 in Verdal. He married Martha Olesdatter Muusem in Verdal on 20 Nov 1818. The groom was listed as being from Aasen Farm, and the bride from Muusem Farm. Zacharias and Martha had the following children: Peder Zachariasen (b 1825), Ole Zarchariasen Ryum (1828-1923), Ingebor Anne Zachariasdatter (b 1830), Zacharias Zachariasen (1833-1854), and Karen Zachariasdatter (b 1840). He is listed in the 1865 census on Sendessvedjan Farm as a “føderpdsmann”, or someone who is receiving a pension after giving his farm to another. Zacharias died 6 Nov 1869 on Sandesvald Farm in Verdal at the age of 76, and was buried on 14 Nov 1869. Martha Olesdatter was born 16 Mar 1797 on Muusem Farm in Verdal, Nord-Trøndelag, Norway. Her parents were Ole Sivertsen Schrove (1770-1849) and Ingebor Andersdatter Muusem (1768-1864). Martha was baptized 26 Mar 1797 in Verdal. She married Zacharias Pedersen in Verdal on 20 Nov 1818. The groom was listed as being from Aasen Farm, and the bride from Muusem Farm. She is listed in the 1865 census on Sendessvedjan Farm living with her husband. Martha died in Verdal 9 Mar 1888 at the age of 90, and was buried on 18 Mar 1888. Christian Anderssen was born in November 1794 on Lund Farm in Børsa, Byneset, Sor-Trøndelag, Norway. His parents were Anders Larsen Neder-Rian (1760-1837) and Malena Christainsdatter Wiggen (1772-1824). Christian was baptized 30 Nov 1794 in Børsa. He married Christenze Dorothea Hansdatter Tÿggestad on 17 Oct 1819 in Naeroy, Nord Trondelag, Norway. The groom was listed as being from Foslandsosen Farm (in Fosnes, Nord-Trøndelag, Norway) and the bride as being from Tÿggestad Farm. Christian and Christenze had the following children: Hans Matheus Christiansen (b 1820), Gjertrud Catharina Christiansdatter (b 1823), Peter Magnus Christiansen Ofstad (b 1826), Christine Dorothea Christainsdatter Slatterøen (1829-1914), Anna Maria Christainsdatter (1832-1858), and Hanna Margrethe Christiansdatter Fjukstad (1836-1907). Christian died on 5 Jun 1840 at the age of 45 on Slatterøen Farm in Nærøy, and was buried on 28 Jun 1840. Christenze Dorothea Hansdatter was born in December 1792 on Tÿggestad Farm in Vikna, Nord-Trøndelag, Norway. Her parents were Hans Nielsen Tÿggestad (1762-1829) and Petternille Marie Danielsdatter Lille Suulen (1759-1830). Christenze was baptized in Vikna on 1 Jan 1793. She is in the 1801 census living on Tÿggestad Farm in Nærøy. She married Christian Anderssen Lund on 17 Oct 1819 in Naeroy, Nord Trondelag, Norway. The groom was listed as being from Foslandsosen Farm (in Fosnes, Nord-Trøndelag, Norway) and the bride as being from Tÿggestad Farm. 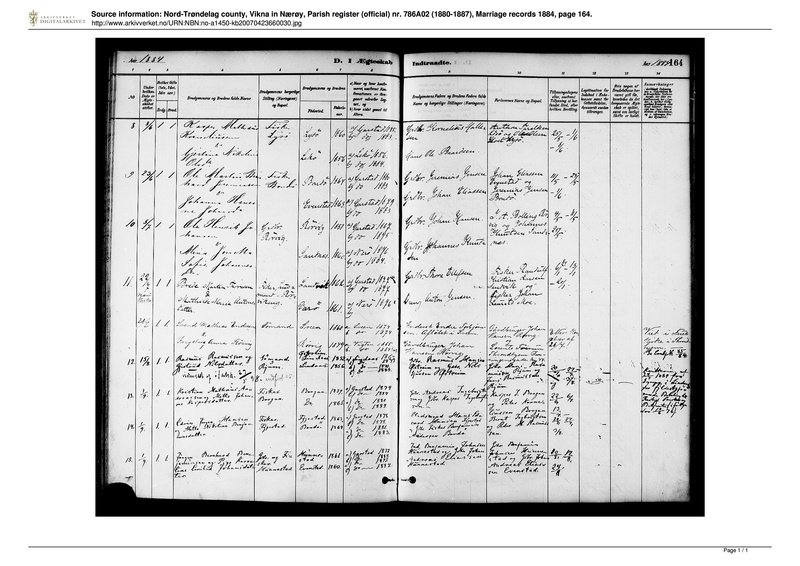 She is listed in the 1865 Census on Slatterøen Farm living with a foster daughter, Albertine Sivertsdatter (b 1850). She died in 1881 in Nærøy at the age of 89. Peder Halvorsen was born on 5 Dec 1751 on Lille Borgen Farm in Verdal, Nord-Trøndelag, Norway. His parents were Halvor Pedersen Lille Borgen (1726-1813) and Elen Sevaldsdatter Lechlem (1721-1798). Peder was baptized on 12 Dec 1751 in Verdal. He married Maridt Zachariasdatter Guddingsvald on 19 Oct 1780 in Verdal. The groom was listed as being from Gudding Farm, and the bride from Guddingsvald Farm. Peder and Maridt had the following children: Maren Pedersdatter (b 1789), Zacharias Pedersen Melbÿe (1793-1869), and Halvor Pedersen (1795-1880). Peder is in the 1801 Census living on Melbÿe Farm in Verdal with his wife and three sons. He died on 21 Nov 1831 on Melbÿe Farm at the age of 79 and was buried on 27 Nov 1831. Maridt Zachariasdatter was born on 29 May 1753 on Guddingsvald Farm in Verdal, Nord-Trøndelag, Norway. Her parents were Zacharias Nielsen Nord-Steene (b 1727) and Agnes Knudtsdatter Jødass (b 1728). She was baptized on 31 May 1753 in Verdal. Maridt married Peder Halvorsen Lille Borgen on 19 Oct 1780 in Verdal. The groom was listed as being from Gudding Farm, and the bride from Guddingsvald Farm. Maridt is in the 1801 Census living on Melbÿe Farm in Verdal living with her husband and three sons. She died on 30 Nov 1825 at the age of 73 on Melbÿe Farm in Verdal, and was buried on 11 Dec 1825. Ole Sivertsen was born on 11 Oct 1770 on Hallum Farm in Verdal, Nord-Trøndelag, Norway. His parents were Sivert Ellingsen Hallem (1739-1797) and Malie Olesdatter Sundbÿe (b 1745). He was baptized on 18 Oct 1770 in Verdal. Ole married Ingebor Andersdatter Muusem on 1 Dec 1796 in Verdal. The groom was listed as being from Schrove Farm, and the bride from Muusem Farm. 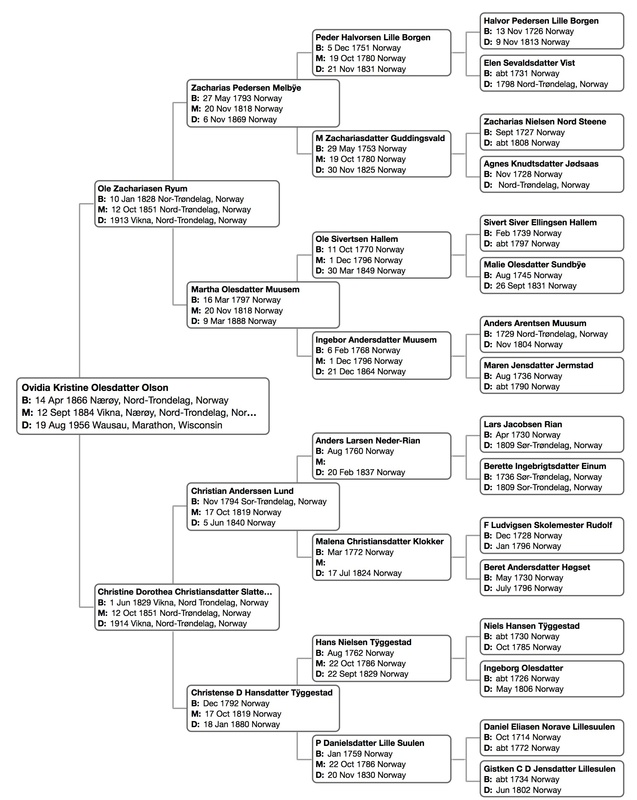 Ole and Ingebor had the following children: Martha Olesdatter Muusem (1797-1888), and Maren Olesdatter (1799-1829). Ole died on 30 Mar 1849 on Muusem Farm in Verdal at the age of 78 and was buried on 4 Apr 1849. Ingebor Andersdatter was born on 6 Feb 1768 on Muusem Farm in Verdal, Nord-Trøndelag, Norway. Her parents were Anders Arentsen Muusems (1729-1804) and Maren Jensdatter Jermstad (1736-1790). She was baptized in Verdal on 14 Feb 1768. Ingebor married Ole Sivertsen Hallum on 1 Dec 1796 in Verdal. The groom was listed as being from Schrove Farm, and the bride from Muusem Farm. Ingebor died on 21 Dec 1864 on Muusem Farm in Verdal at the age of 96 and was buried on 6 Jan 1865. Anders Larsen was born in August, 1760 on Neder-Rian Farm in Børsa, Sor-Trøndelag, Norway. His parents were Lars Jacobsen Rian (1730-1809) and Berette Ingebrigtsdatter Einum (1736-1809). Anders was baptized on 10 Aug 1760 in Børsa. Anders had a child out of wedlock, Andreas Andersen, who was baptized in Børsa on 25 Sept 1791. The mother was listed as “Karen Christiansdatter”, Anders was listed as living on Elie Farm. He had another child out of wedlock, Christian Anderssen, who was born in Nov 1794 on Lund Farm and baptized in Børsa on 30 Nov 1794. The mother was listed as Malena Christiansdatter. “Karen Christiansdatter”, the first mother may have been Malena’s older sister Maren Christiansdatter. Finally, on 10 Jul 1794 Anders married Karen Jensdatter Myrren (the second girl of that name born to her family) in Børsa. Both the groom and bride were listed as being from Elie Farm. Anders and Karen Jensdatter had the following children: Benjamin Andersen (b 1795), Anders Anderssen II (b 1797), Lars Anderssen (b 1798), Jacob Anderssen (b 1801), Ane Andersdatter (b 1801), Jacob Anderssen II (b 1803), and Ole Anderssen (b 1806). Anders and Karen are in the 1801 Census for Byneset, Sor-Trøndelag, Norway living on Lund Farm living with five of their children. He is listed as “Huusmand”, or someone who pays the rent on the land he occupies by doing labor for the farmer who owns the land. Anders died on 20 Feb 1837 on Lund Farm in Børsa at the age of 76, and was buried on 26 Feb 1837. Malena Christiansdatter was born in September, 1772 on Klokker Farm in Børsa, Sor-Trøndelag, Norway. Her parents were Christian Rudolf Skolemester Klokker (1728-1796) and Beret Andersdatter Høgset (1730-1796). Malena was baptized on 24 May 1799 in Børsa. She had a child out of wedlock, as stated above, with Anders Larsen Neder-Rian in 1794, named Christian Anderssen. She had another son out of wedlock with Enoch Viggen who was baptized on 11 Feb 1798 in Børsa, named Johann Enochsen. She was listed as “Malena Hvidskjæret” on that baptism record, indicating she was living on Hvidskjæret Farm at the time. Finally she married Peder Olsen Sildvaert on 24 May 1799 in Børsa. The groom and bride were both listed as being from Wiggen Farm. Malena can be found living with Peder with their legitimate daughter Elen Pedersdatter (baptized 9 Mar 1800) and her son Johan Enochsen on Wiggen (Viggen) Farm in the 1801 Census. Malena died 17 Jul 1824 on Wiggen Farm in Børsa at the age of 51. Hans Nielsen was born in August 1762 on Tÿggestad Farm in Verdal, Nord-Trøndelag, Norway. His parents were Niels Hansen Tÿggestad (1722-1785) and Ingebor Olesdatter Ørtuen (b 1727). Hans was baptized on 29 Aug 1762 in Vikna. He married Petternille Marie Danielsdatter Lille Suulen in Vikna on 22 Oct 1786. The groom was listed as being from Tÿggestad Farm, the bride from Suulen Farm. Hans and Petternille had the following children: Niels Hansen (b 1786), Daniel Hansen (1789-1866), Christenze Dorothea Hansdatter (1792-1881), Maren Maria Hansdatter (b 1795), and Peder Hansen (b 1800). Hans is listed in the 1801 Norway Census on Tÿggestad Farm with his wife and five children. He is listed as a peasant farmer. He died on Tÿggestad Farm on 22 Sept 1829 at the age of 67, and was buried in Nærøy, Nord-Trøndelag, Norway on 31 Jan 1830. Petternille Marie “Pernella” Danielsdatter was born in January 1759 on Lille Suulen Farm in Vikna, Nord-Trøndelag, Norway. Her parents were Daniel Eliasen Norave Lillesuulen (1714-1772) and Gistkin Christenze Dorothea Jensdatter Lillesuulen (b 1734). Petternille was baptized 2 Feb 1759 in Vikna. She married Hans Nielsen Tÿggestad in Vikna on 22 Oct 1786. The groom was listed as being from Tÿggestad Farm, the bride from Suulen Farm. She is listed in the 1801 Norway census with husband and five children. She died on Heillesöen Farm in Nærøy, Nord-Trøndelag, Norway on 20 Nov 1830 at the age of 71, and was buried on 1 May 1831, presumably after the Spring thaw. Halvor Pedersen was born on 13 Nov 1726 on Borgen Farm in Verdal, Nord-Trøndelag, Norway. His parents were Peder Olsen Borgen and Karen Nielsdatter. Halvor was baptized on 9 Jan 1727 in Verdal. He married Elen Sevaldsdatter Lechleum in Verdal on 29 Sept 1751. The farm of the bride and groom were not listed. Halvor and Elen had the following children: Peder Halvorsen (1751-1831), Sevald Halvorsen (b 1753), Gjertrud Halvorsdatter (b 1755), Anne Halvorsdatter (b 1759), and Dorthe Halvorsdatter (b 1762). The couple seems to have moved around, as they were listed on Lille-Borgen, Huusem, and Lechlems Farms for the baptism records of their children. Halvor is listed in the 1801 Census on Borgen farm in Verdal. He died on Borgen Farm in Nov 1813 at the age of 86, and was buried on 9 Nov 1813. Elen Sevaldsdatter was likely born about 1726-1731 in Verdal, Nord-Trøndelag, Norway. So far her baptism record has not been located. She married Halvor Pedersen in Verdal on 29 Sept 1751. The sponsors of the marriage were Ole Sevaldsen Lechlem and Anders Andersen Holme, so it is very likely Elen’s parents were Sevald Olsen Vist Sticklestad (father of Ole) and his third wife Karen Joensdatter Holme. Elen died in Verdal some time before 1801, likely on Lechlem or Borgen Farm, as her husband is a widower in the 1801 Census. Zacharias Nielsen was born in September 1727 on Nord-Steene Farm in Verdal, Nord-Trøndelag, Norway. His father was Niels Olsen Nord-Steene. He was baptized on 28 Sept 1727 in Verdal. He married Agnes Knudtsdatter Jødsaas on 8 Oct 1752 in Verdal. The groom was listed as being from Nord-Steene Farm, and the bride from Jødsaas Farm. Zacharias and Agnes had the following children: Maridt Zachaiasdatter (1753-1825), Niels Zachariasen (b 1754), David Zachariasen (b 1756), Knudt Zachariasen (b 1758), Ole Zachariasen (b 1759), Berete Zachaiasdatter (b 1770). Zacharias is listed as a farmer in the 1801 Census on Gudding Østre farm with his wife Agnes. So far his death or burial records have not been found. But he most likely died around 1805 in Verdal. Agnes Knudsdatter was born in November 1728 on Jødsaas Farm in Verdal, Nord-Trøndelag, Norway. Her father was Knudt Amundsen Jødsaas. So far her mother is not known. Agnes was baptized on 24 Nov 1728 in Verdal. She married Zacharias Nielsen Nord-Steene on 8 Oct 1752 in Verdal. The groom was listed as being from Nord-Steene Farm, and the bride from Jødsaas Farm. So far her death or burial records have not been found. But she most likely died around 1805 in Verdal. Sivert (also Siver) Ellingsen was born in February, 1739 on Hallem Farm in Verdal, Nord-Trøndelag, Norway. His parents were Elling Jensen Hallen (1700-1776) and Marit Jonsdatter Hallem (1698-1778). Sievert was baptized on 4 Feb 1739 in Verdal. Sivert married Malie Olesdatter Sundbÿe on 5 Apr 1769 in Verdal. The groom was listed as being from Hallem Farm, and the bride from Sundbÿe Farm. Sievert and Malie had the following children: A stillborn daughter (1769-1769), Ole Sievertsen (1770-1849), Marith Siversdatter (b 1773), Marith Siversdatter II (b 1774), Sara Sivertsdatter (b 1777), Erling Sivertsen (b 1779), Lars Sivertsen (b 1782), Joen Sivertsen (1784-1791), Marith Sivertdatter III (b 1784), Peder Sivertsen (1787-1836), Sivert Sivertsen (b 1790), and Ingebor Sivertsdatter (b 1792). Sivert died in Verdal sometime between 1792 and 1801 as his wife is listed as a widow in the 1801 Census. So far his burial record has not been found. Malie Olesdatter was born in August 1745 on Sundbÿe Farm in Verdal, Nord-Trøndelag, Norway. Her father was Ole Baarsen. Her mother is not known, but there is may have been Anne Larsdatter Rognan (marriage record in Verdal, 6 Dec 1733). Malie was baptized 29 Aug 1745 in Verdal. She married Sivert Ellingsen on 5 PAr 1769 in Verdal. The groom was listed as being from Hallem Farm, and the bride from Sundbÿe Farm. Malie is listed in the 1801 Census for Verdal on Schrove Wæster Farm with her second husband, Ellev Joenssen and seven of her children from her first marriage. Maile and Ellev were married in Verdal on 30 Oct 1800. She died on Schrove Farm in Verdal on 26 Sept 1831 at the age of 86 and was buried on 11 Oct 1831. Anders Arentsen was born about 1729 (per his entry in the 1801 census), presumably in Verdal, Nord-Trøndelag, Norway. His father and mother are not so far identified. He married Marith Jonsdatter in Verdal on 19 Jun 1765. The bride and groom were both listed as being from Muusems Farm. Marith died from complications of childbirth with their daughter Marith Andersdatter in Jun of 1765. In fact, his wife gave birth three hours after returning from the church after their marriage, so the marriage and birth records share the same date of 19 Jun 1765. Then his wife died and was buried on the same day their daughter was baptized, 26 Jun 1765. The daughter died shortly after that. Anders remarried to Maren Jensdatter in Verdal on 19 Mar 1766. The groom was listed as being from Muusems Farm, the bride from Jermstad Farm. Anders and Maren had the following children: Ingebor Andersdatter (1768-1864), Peder Andersen (b 1776), Marith Andersdatter II (b 1779). Anders is in the 1801 Census for Verdal living on Muusem Farm and listed as “widower of his 2nd marriage”. He died on Muusem Farm in November 1804 at the age of 75 and was buried on 4 Nov 1804. Maren Jensdatter was born in August, 1736 on Jermstad Farm in Verdal, Nord-Trøndelag, Norway. Her father was Jens Stephensen Jermstad, and her mother was Sophie Iversdatter Follostuen. Maren was baptized on 19 Aug 1736 in Verdal. She married Anders Arentsen Muusem in Verdal on 19 Mar 1766. The groom was listed as being from Muusems Farm, the bride from Jermstad Farm. She died sometime between 1779 and 1801 as her husband is listed as a widower in the 1801 census for Verdal. So far her burial record has not been located. Lars Jacobsen was born in April, 1730 on Klochervig Farm in Børsa, Sør-Trøndelag, Norway. His father was Jacob Larsen and his mother was Mari Halvorsdatter. He was baptized 2 Apr 1730 in Børsa. He married Berette Ingebrigtsdatter on 10 Jul 1760 in Børsa. The groom was listed as being from Rian Farm, the bride from Neder-Rian Farm. Lars and Berette had the following children: Ingebrigt Larsen (b 1757), Anders Larsen (1760-1837), Jacob Larsen (1763), Berit Larsdattter (b 1767), Randi Larsdatter (b 1771), and Lars Larsen (b 1779). You may notice that their first child was born three years before they were married. The baptism record lists both parents, so it was the same couple. Lars is in the 1801 Census for Byneset living on Lund Farm with his wife. He is listed as “Inderst og fattig”, renter and pauper. Lars died in Børsa in 1809 at the age of 79 according to the Borsaboka, p139. So far his burial record has not been located. Berette Ingebrigtsdatter was born about 1736 in Børsa, Sør-Trøndelag, Norway, according to the Borsaboka, however, her birth year was given as 1738 in the 1801 Census. Her parents were Ingbrigt Jonsen and Randi Pedersdatter Rian. She married Lars Jacobsen Rian on 10 Jul 1760 in Børsa. The groom was listed as being from Rian Farm, the bride from Neder-Rian Farm. Berette is in the 1801 Census living on Lund farm in Børsa with her husband. She died in 1809 in Viggja, Sør-Trøndelag, Norway, per the Borsaboka. So far her death record has not been located. Christian Rudolf Skolemester. There are Norwegian genealogy texts which say that Christian Rudolf Skolemester was born in Germany and that his origins are not known, but I believe I have a narrative which makes more sense given the records which are available. The baptism record of Malene Christiansdatter in 1772 lists her father as “Christian Skolemester” . We can also look at the records for her siblings. Susanna Christiansdatter, 28 Jan 1753:  To Christian Skolemester a daughter Susanna. Witnesses: Even Rian, Johan Högsaett, Gertrude Högsaett, Brünild Wigen, Karen Högsaett. Anders Christiansen, 13 Jan 1755: To Christian Skolemester a son Anders. Witnesses: Jonas Vilmand, Anders Högsaed, Jon Högsaed, Elisabeth Wigen, Gurri Högsaed. Marite Christiansdatter, 17 Jul 1757: To Christian Skolemester a daughter Marite. Witnesses: Arent Engen, Ingebright Wigen, Marite Rian, Anna Wigen, Marite Meland. Johan Rudolph Christiansen, 16 Dec 1759: To Christian Skolemester a son Johan Rudolph. Witnesses: Benit Orchedals, Hans & Sivert Vigen, Ole Linden, Maria Vigen, Ingeborg Meland. Johanna Christiansdatter, 28 Oct 1762: 28 Oct. To Christian Skolemester a daughter Johanna. Witnesses: Ingebrigt Eljeslöchen, Roen ? ?, Berette Engen, Karen Jögsaet, Berette Olesdatter Wigen. Falantin Christensen, 19 May 1765: To Christian Skolemester a son Falantin. Witnesses: Peder Vigen, Lars Lunden, Lars Engen, Guri Lunden, Inger Wigen. Maren Christiansdatter, 4 Sept 1768: To Christian Skolemester a daughter Maren. Witnesses: Iver, Johann and Gunnil Schietnen, Ane Satten, Gjertrud Högsaet. 1st sondägen (10 Jan 1796) burial of Christian Rudolph Skolemester Wiggen age 68 years. So it gives his birth as being around 1728. 3rd Adventus (15 Dec 1728) – To Ludvig Coplou and Guru Pedersdatter a son Franz Christian. Witnesses: Erich ? ?, Ernst Lang, Siur Heador, Ole Wiggen, Ole Maziter, Jodas ??. So we can see a Ludvig Coplou (hardly a Norwegian name) with a son Franz Christian and witnesses on Wiggen Farm. I’m guessing this is the right person, and that it was his father Ludvig who came to Børsa from Germany and, apparently, married a Norwegian woman. It was quite common for a German man to use a second or third name as his “first” name in practice. For example, my grandfather Carl Ernst Wilhelm Schmidt went by “Wilhelm”. Christian had a brother, Johan Ernst Ludvigsen who was baptized 1 Dec 1731 in Børsa. Christian was engaged to Beret Andersdatter on 9 Nov 1752 and the couple was married on 30 Nov 1752 in Børsa. The groom was listed as being from Rudolf Farm and the bride from Høgset Farm. They had the children listed above. As mentioned previously, Christian died in January 1796 at Wiggen Farm at the age of 67, and was buried on 10 Dec 1796 in Børsa. Beret Andersdatter was born in May 1730 on Høgset Farm. Her father was Anders Høgset and her mother is not known. Beret was baptized 18 May 1730 in Børsa, Sør-Trøndelag, Norway. She was engaged to Christian Skolemester on 9 Nov 1752 and the couple was married on 30 Nov 1752 in Børsa. The groom was listed as being from Rudolf Farm and the bride from Høgset Farm. Beret died in July 1796 on Wiggen Farm at the age of 67, and was buried on 17 Jul 1796 in Børsa. Niels Hansen was born about 1722 in Vikna, Nord-Trøndelag, Norway on Nord Gieslingen Farm. His father was Hans Erichsen Binderøy and his mother was Merit Olesdatter. Neils married Ingebor Olesdatter, likely in Vikna, about 1757. Their marriage record has not been located. They had the following children: Friedrich Nielsen (b 1758), Hans Nielsen (b 1762), Ole Nielsen (b 1766), Beret Maria Neilsdatter (b 1767), Hans Nielsen (b 1770). The baptism record for their last son, born in 1770, lists both parents. Niels was listed as living on Hunnestad Farm in 1758, and then on Tÿggestad Farm starting in 1759. He died on Tÿggestad Farm in Vikna in 1785, according to his probate documents which were filed in October, 1785. The probate documents list only Friedrich, Hans (b 1762) and Beret along with their mother, so it is likely the other two children died before 1785. Ingeborg Olesdatter, wife of Niels Hansen, is something of an enigma. There is an Ingeborg Olesdattter who was born on Ørtugen Farm in Verdal in September, 1727, but the evidence suggests that this is not the same woman. That Ingeborg married a Thomas Olsen Sør-Steene in 1754, and he died in 1804. Therefore, I don’t believe she is the one who married Neils Hansen and lived in Vikna. The correct Ingeborg was mentioned as the wife of Niels Hansen Tÿggestad in the baptism record for their son Hans in 1770. She was also mentioned in the probate documents for her husband in 1785 as living at Tÿggestad Farm. In the 1801 census for Tÿggestad Farm in Nærøy, Nord-Trøndelag, Norway, she is listed as “widowed” (her husband died in 1785), and as being born in 1726. She died in May 1806 in Vikna and was buried on 4 May 1806. Her burial record gives her age as 70 years, which would indicate a birth year of 1836, rather than 1826. 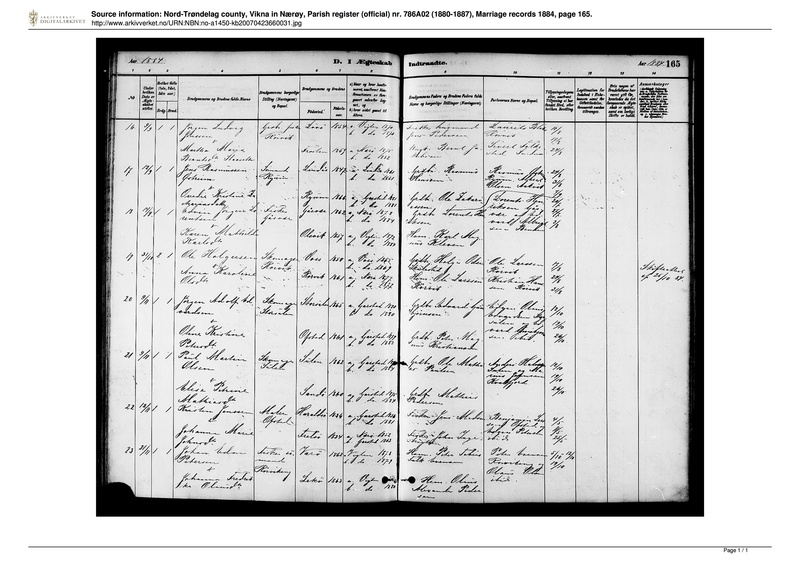 The Census birth date is not, however, a transcription error as it clearly reads her age as 75. Daniel Eliassen was born in October 1714 at Norave Farm in Vikna, Nord-Trøndelag, Norway. He was baptized 1 Nov 1714 in Vikna. He married Gistken Christenze Dorothea Jensdatter in Vikna on 28 Aug 1751. The groom was listed as being from Lille-Suulen Farm. No farm was listed for the bride. The couple had the following children: Simeon Danielsen (1752-1752), Gunelle Danielsdatter (b 1755), Petternille Marie Danielsdatter (1759-1830), Uldricha Danielsdatter (b 1762), Ollegaard Danielsdatter (b 1765), and Ollegaar Danielsdatter (b 1769). According to Norwegian Genealogy forums, Daniel ran Lille-Suulen farm until 1772 when ownership was transferred. It might be assumed that he died at that time. So far no burial record has been located. Gisken Christenze Dorothea Jensdatter was born about 1734 according to the 1801 Census. Others have speculated she was born in Trondheim about 1726. There are missing records for Vikna about this time, so her baptism record may be lost. Her parents were Jens Joensen and Gjertrude Krag. Jens was said to have come to Vikna to run Lillesulen farm about 1730. Gisken Christenze married Daniel Eliasen on 28 Aug 1751. The groom was listed as being from Lillesulen farm. No mention was made for the bride, but we know her father was living there and it’s most likely she was living there also. In the 1801 Census she is living on Tÿggestad Farm with her daughter Peternille and son-in-law Hans Nielsen, and is listed as “Christenz Jensdatter, single dependent pensioner, born 1734”. Christenze died in Jun 1802 at Lille-Sullen Farm at the age of 68, and was buried 27 Jun 1802 in Vikna. I found a database in Norway that allows you to search for people who were given permits to emmigrate to America. 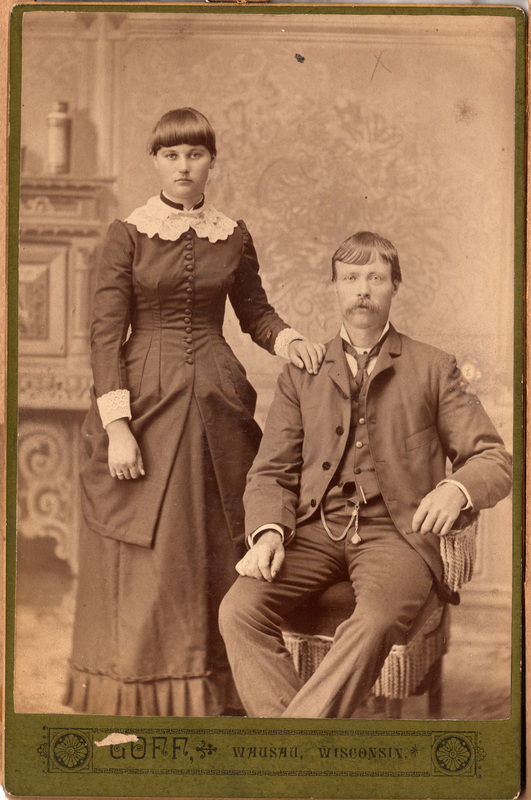 I found my 2x-great-grandparents Jens Rasmussen and his wife Ovidia Olesdatter in the database. Their daughter Olga Hanson Schmidt had said the couple were on their way to America three weeks after they got married, and she wasn’t far off. They were married in Vikna on 12 Sept 1884 and left for American on 9 Oct 1884, so 27 days later! 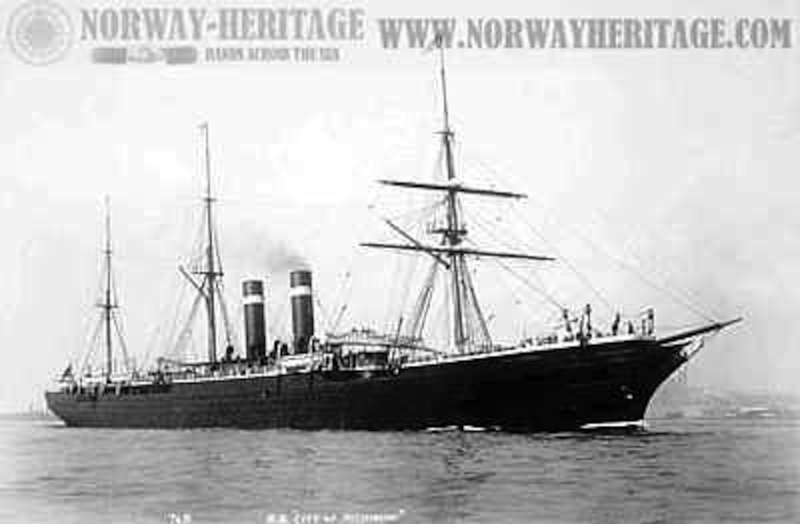 Unfortunately the documents do not tell us which ship they took, but it does say it was one of the “Inman Line” leaving from Bergen, Norway. 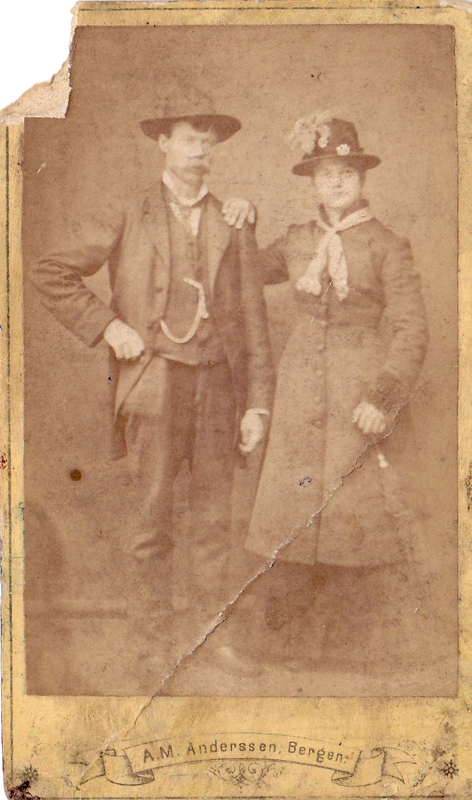 Portrait of Jens and Ovidia taken in Bergen, Norway, in 1884 just before their departure for America. From Bergan, my grandparents would have taken a smaller steamer, either the “Oder” or the “Argo”, to Hull. They would be in the UK three days before departing from Liverpool to New York. “SS City of Chicago” – In Queenstown 3 Oct 1884 – Left too early to be a candidate. “SS City of Montreal” – Arrived New York 9 Nov 1884. “SS City of Richmond” – Arrived New York 24 Oct 1884. So there are four possible ships they could have been on: “SS City of Berlin”, “SS City of Chester”, “SS City of Montreal”, and “SS City of Richmond”. In Olga’s recounting of our family history Ovidia had said that the crossing took “two good weeks”. So if they left 9 Oct, they would have arrived about 23 Oct. That makes the “SS City of Richmond” the most likely candidate since it arrived on 24 Oct 1884. The Chester only took 8 days to cross, and the “Berlin” and “Montreal” would have taken more than three weeks to cross since they arrived on 1 Nov 1884 and 9 Nov 1884 respectively. Based on our family history, my guess is that they left aboard the “SS City of Richmond”, arriving in New York on 24 Oct 1884. I’m attaching two images of the “City of Richmond”, one is a photograph taken in 1874. I recently found many records related to the family of my 2x great-grandmother Ovidia Kristine Olsdatter (Olson in America). I had some information on her family that I had been given by my cousins still living in Norway, and these records aligned at every point with what they had said. I’m very excited that more records from Norway are making their way online. The next record is the birth and baptism record for my 3x great-grandfather. It also gave me the name of his parents. Until now I only new his father was Zacharias. There is another marriage record the same day in the town of Stiklestad. One may just be a more specific record than the other.